Patients today expect to be able to reach a provider any time of the day and night, including weekends. Yet, as a provider, it is difficult to justify the hours and costs involved in being available to help patients evaluate their symptoms. Triage nurses offer a great solution to ensure patients receive consistent care even when doctors are not available. Triage nurses use standardized protocols, such as Schmitt-Thompson protocols, to ensure consistent and appropriate care, and doctor’s custom- orders to ensure follow-up instructions specific to each doctor. Preventing unnecessary ER admissions has also been an important driver for ensuring patients have access to healthcare professionals who can assess their symptoms and determine the level of care needed to address their symptoms. A report from the Health Care Cost Institute found that on average an emergency room visit costs about $2,000. Fortunately, a telephone nurse triage service can be used as an important tool for hospitals to combat unnecessary patient admissions. In this study, we examine a sample of about 35,000 calls from our telephone triage call center for three months (outside of flu season). 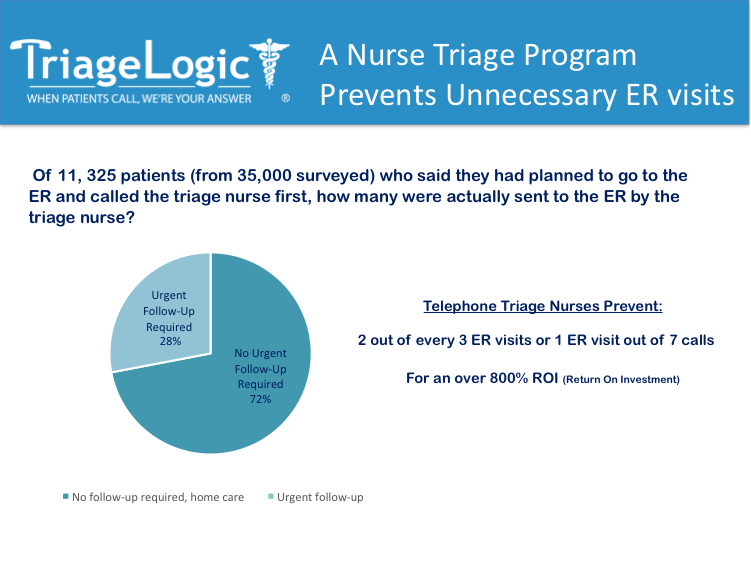 We found that our telephone triage nurses were able to decrease unnecessary emergency room visits. The nurses prevented 2 out of every 3 ER visits or 1 ER visit out of 7 calls. Patients called a nurse by telephone and spoke to an answering service agent. The agent entered the patient demographics and the reason for calling into the TriageLogic software and nurses returned the call. Patients were called back within 30 minutes. All nurses who called patients were registered nurses. 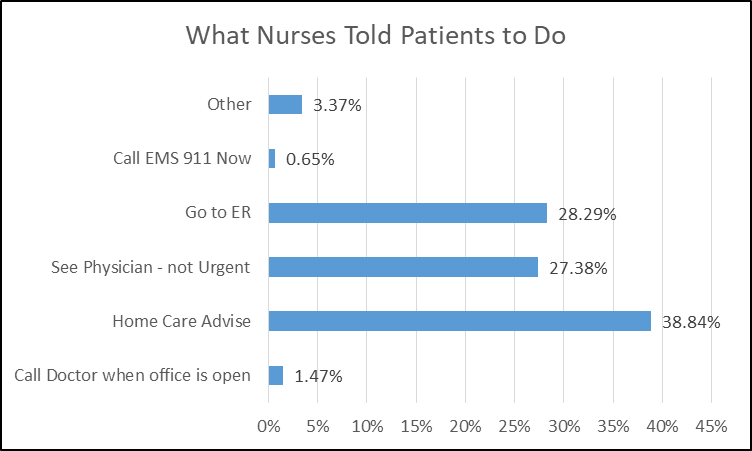 Prior to triaging each patient, nurses randomly asked patients what they would do if they did not have access to a triage nurse (see Figure 1). The nurses surveyed 35,559 patients during the calls. Figure 1 below describes the patient answers from the survey. 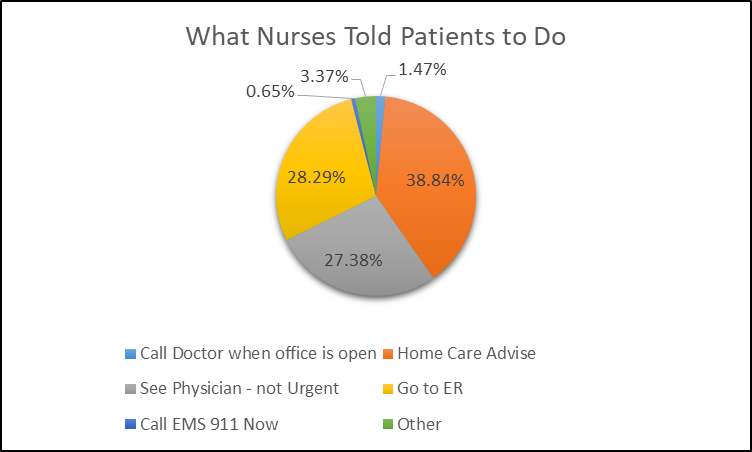 Out of all the patients surveyed, 11,135 said that they would have gone to the emergency room (ER) if they did not have access to nurse triage. In addition, 1,819 patients would have gone to an urgent care center. Figure 1. Q. What would you do if you did not have access to nurse triage? Next, after answering the survey questions, patients were triaged using standardized protocols from Dr. Bart Schmitt (for pediatric calls) and Dr. David Thompson (adult calls). 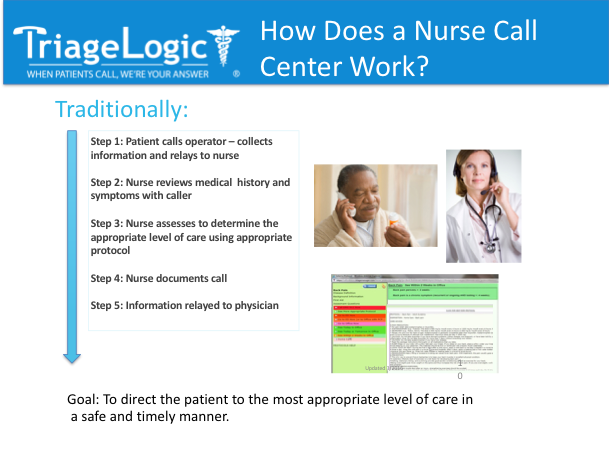 Nurses documented the patient disposition and patient outcome into the TriageLogic Call Center Software. We compared what the patients were told do to with what the patients expected to do prior to being triaged. Note: these are patient answers from a survey asking them what they would do if they did not have access to nurse triage. Figure 2. What was the disposition determined by the triage nurses for the patients who answered that they would “go to the emergency room”? As the table and the chart demonstrate, only a fraction of the patients planning to go to the ER was told that theyneeded immediate care. Out of the 11,135 patients expecting to go to the emergency room, nurses only told 3,222 patients to seek immediate care. All other patients were able to get home care or see their physicians the next day. That is, only about 30% (3,222/11,135) of the callers who expected to go to the ER were told to go to the ER. Based on the findings of this study, it is clear that providing patients with a nurse triage program will not only help patients reach the right level of care but will also prevent unnecessary ER visits. With the stress and high cost of ER visits, nurse triage programs can save patients time and money. If you are interested in finding out more about giving your patients access to quality registered nurses after-hours, contact us today.